Continuing Education and Community Service Center (CEC) of Al-Quds Open University was established in 1991 to serve the Palestinian community and provide continuous education and lifelong learning opportunities to all segments of the Palestinian community. 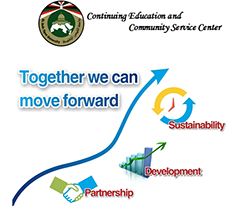 The Center effectively contributes to the development of the capabilities of individuals and institutions through providing vocational and technical training services that comply with local and international quality standards, in addition to providing administrative and technical consulting services and implementing community and development projects. Leadership in providing vocational and technical training services, and preparing and implementing developmental projects (administrative and technical), that contribute to the Palestinian capacity building of all segments of the society, in accordance with local and international quality standards. Providing continuous vocational and technical training and advisory services, and implementing developmental projects that aim at enhancing the capacities of the marginalized groups in the community as well as in different institutions in accordance with the strategies of the center in adopting “Partnership for Sustainable learning” and “life Long Learning ” through improving the provided services in accordance with local and ” international best practices “, that comply with the mission and objectives of the University. Contribute to achieve the University’s mission in enhancing the capacities of QOU and empowering the members of the Palestinian community. Contribute to community development and achieve excellence in accordance with the strategic plans of higher education in Palestine. Strengthen the relations between the University and the community, through providing professional and technical training services and financial and administrative counselling to the community. Provide lifelong learning opportunities based on community partnership for all the Palestinian people. Community partnership and institutional networking with Palestinian, regional and international institutions.